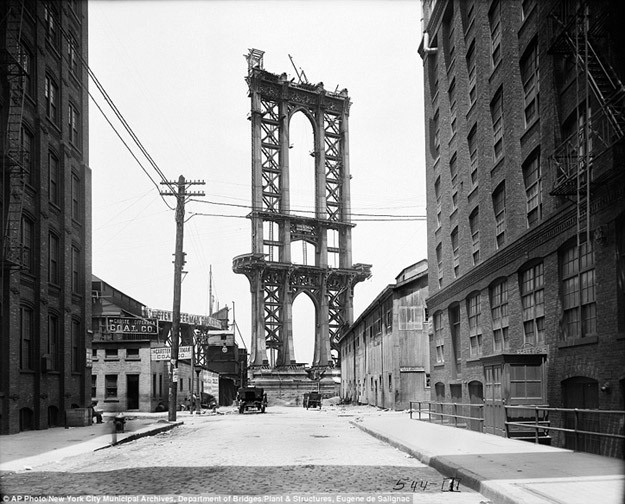 New York City’s Department of Records announced last week that it would be making almost 900 thousand photographs from the Municipal Archives collection available to the public for the first time online. The photographs date back to the late 19th century and span the early 20th century. The response has been so overwhelmingly interested that the site has been down since the launch, something I’m sure they were not anticipating. But how could they not? The Daily Mail featured a few images from the collection, and from this preview it is no wonder the public interest has been so intense. 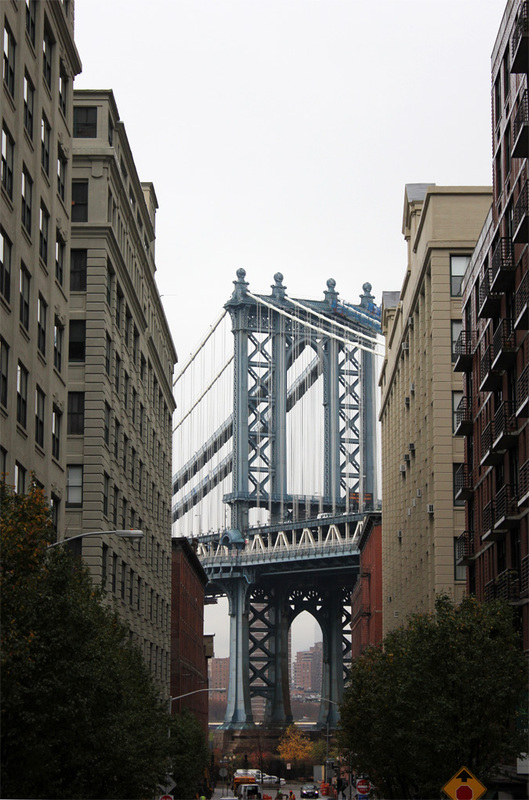 That last photograph of the Manhattan Bridge reminds me of a shot I took a few months ago when I was in the city last. I can’t wait until the site goes back up so I can browse the archives; imagine how many more incredible shots there are just waiting to be seen. Don’t you just love the old signage (breakfast special with coffee was only 10¢!) 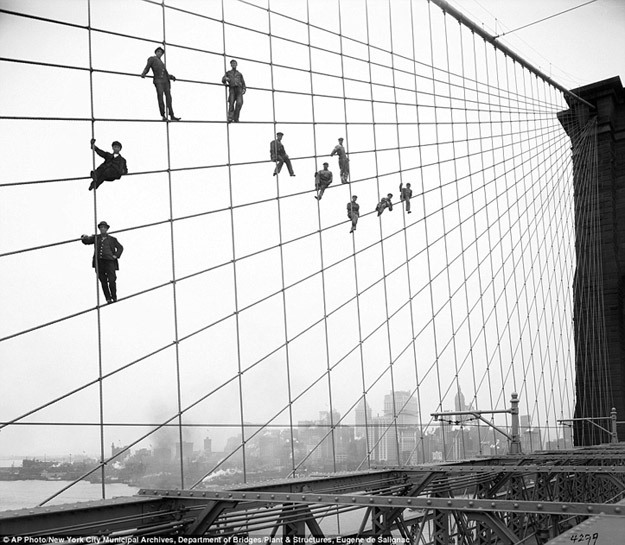 and those men painting the cables on the Brooklyn Bridge is making my knees all wobbly. I love the little barefoot Jewish boy in the first shot, too. This whole thing go me thinking about my senior capstone course in college. The journalism school was split into 4 different tracks (Broadcast, Magazine, News-Editorial, Photojournalism) and aside from a few general lecture classes, each track had their own course schedule that focused specifically on their given field. The capstone course was different in that instead of working independently in our own tracks and only with people who had the same concentration, we were put in teams with kid from other tracks and assigned a neighborhood in Philly. We were given a semester-long assignment to report from that neighborhood (Fishtown represent! ); the content of each weekly report we delivered was up to us to decide, but we were responsible for turning in something that utilized each of the skill-sets of our different team members. Mine was a group of three, one from Broadcast (my friend Chris, who now works as an anchor for CBS in Charlottesville), and one from Magazine. Each week we turned in a written article, a video, and a photo essay. I just bored you with all those details because one particular project really stuck with me, and I was reminded of it when I saw this old pictures of New York. For my capstone, I used the Urban Archives available through the university, a huge database of thousands of old pictures of Philadelphia from the past 150 years, to find photographs of our assigned neighborhood from the last century. I then went to each of the locations and photographed what was there now. Rephotography. Simple, yet somehow brilliantly so, and I wish I could take credit for the idea. It was thrilling to me to track down a specific intersection or house or park and line my shot up exactly as it was in the original photo. For the most part, Philadelphia has stayed much the same. But I imagine the same can’t be said for New York. 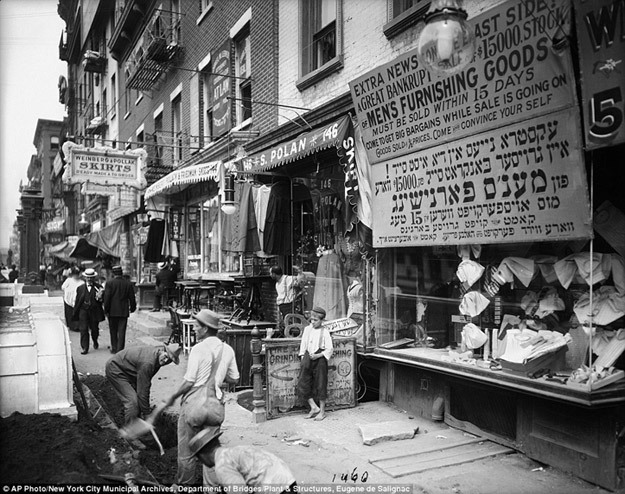 Wouldn’t it be incredible, once the New York Department of Records’ archive site goes live and can handle the influx of curious visitors, to go to those streets and see what’s there now? 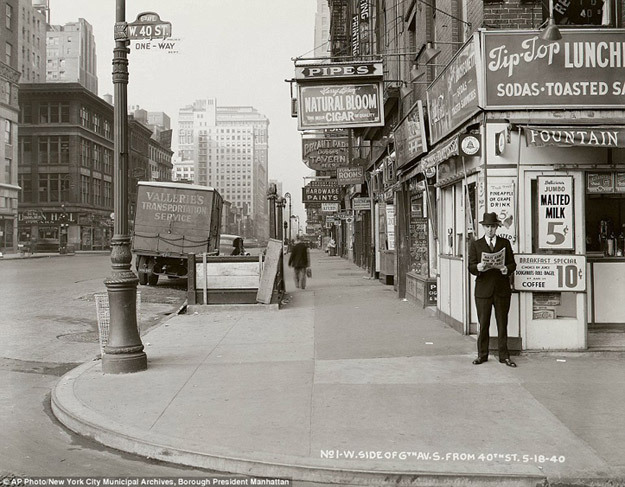 I bet 40th and 6th Avenue looks a lot different today than it did in May of 1940. 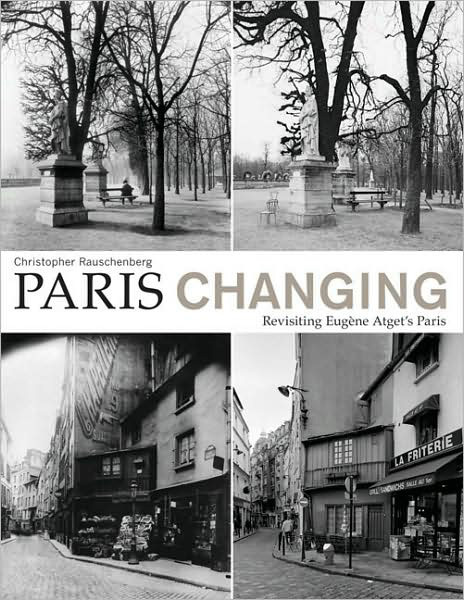 My favorite rephotography project is one by Christopher Rauschenberg, who used photographs by famous French photographer Eugene Atget and traveled around Paris for a year, revisiting and photographing 75 different images. The book, “Paris Changing” is phenomenal, and I love having it on my coffee table. It combines several of my favorite things in one. As far as photobooks go, this one is really something special. 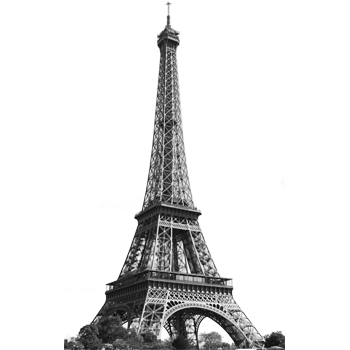 All this to say that two weeks from today, I will be in Paris, taking my own photographs. You guys. I don’t think I’ve ever been happier to see a Friday before. Really. It’s gray and slightly chilly here this morning and I was still lifted by the fact that it was indeed the last day of the work week, the one impediment standing between me and the ability to spend a full-day in pajamas. An awesome thing about my job (and there are many, many awesome things about my job) is the flex-hour work schedule; once you hit your 80 hours for the pay-period, you’re free to go. How you work those hours is up to you. Want to work 10 hours a day, Monday through Thursday and take Friday off? Most people do just that in the summer to head down to the shore early. Any amount you work over 8 hours a day you can subtract from the last day of the pay-period, pretty much. So today, there are only 4 short hours standing in my way. Four! The office is virtually empty after 1 or 2 on Fridays anyway, and I’m taking advantage of it and skipping out early to see my friend Aidan, who had her tonsils out this week, poor thing. I bought this bag for Boyfriend for our trip (2 weeks from this Sunday) to use as a carry-on for his laptop and stuff, so he wouldn’t have to take his leather Kenneth Cole bag he carries daily for work. I was worried he wouldn’t like it, given that it’s not exactly his style, but he gave it two thumbs up, and that gave me an excuse to go ahead and order the Poppy King lipstick I’ve been eyeing forever (I wasn’t going to spend $9 on shipping for just a lipstick) along with it. The bag seems sturdy enough to hold his laptop and camera and passport, but light enough that he could easily use it during the day while we’re sight-seeing. Plus, I’m totally going to steal it once we get home. At my brother’s birthday brunch this past weekend, his brother-in-law gave him a box of liquor that was all made in Philadelphia. I didn’t know Bluecoat was distilled here, but you know what I do know? Without sounding like a raging alcoholic, I love gin. I love it with ginger ale, I love it with tonic, and I predict that one day I will be able to handle a dirty martini without making faces and feeling like I’m being poisoned. Baby steps! How beautiful is that bottle, though? 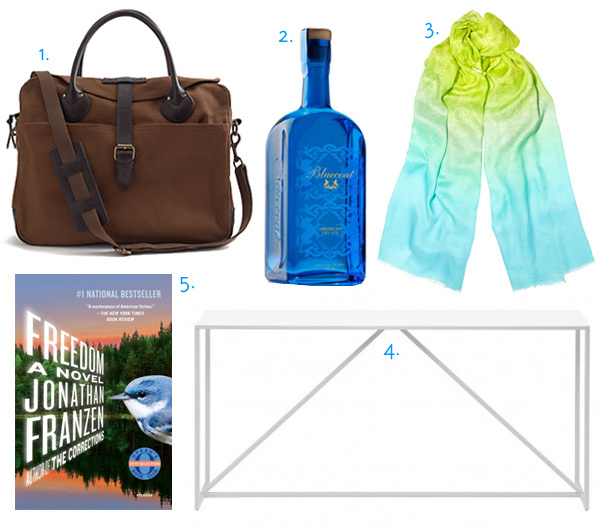 It sort of matches the hues of that Jonathan Saunders scarf. I am loving that color combination this spring. It has a faint paisley pattern on it, but until the price drops 90%, I’m not going anywhere near it lest the gin tricks me into buying it. In case you needed clarification, that scarf is more expensive than a 60″ console table. I’ve had my eye on this skinny number for a while, and think it would look great behind the sofa, stacks of art and interior books behind it, maybe a mercury glass candle for good measure. Again, one of those things I’m waiting to go on sale, and hoping that in the interim, the DIY-fairy strikes me or I become divinely inspired to make my own for cheap. What do you guys think? Buy it or craft it? Okay lovelies. What are you up to this weekend? Tomorrow Boyfriend is going golfing early in the morning with a few buddies, and that evening we’re heading to a Fashion Show and cocktail party (John Varvatos will be there!) with my mom and her boyfriend. Sunday, my boss is having a house-warming party at his house and invited our group over (one of those awesome things about my job). Somewhere in there I’m planning on doing absolutely nothing. What about you? Taking it easy or going going going? Take care, kiddos! It is infinitely more difficult to wake up on the right side of the bed when it is dismal and raining outside. I’m not exactly what you would call a morning person (or, for that matter, a night person, given my proclivity to fall asleep at 9:45 most nights) as it is, but I find it exceptionally hard to rally or even peel the covers off of me when what’s outside is gloomier than the prospect of leaving my toasty bed. Whine whine whine! To apologize to you lovely, fabulous ladies for my debby-downer mood today, I have 2 Like a Picture posts to share with you. I deviated from what I’ve done so far and used pictures that weren’t of soft-focus women from the chin down. I think I enjoy using those sort of pictures more (and I have plenty in my reserve pile I can use in the coming weeks), but it was interesting to work with non-human subjects; the process was similar but a lot more literal. I haven’t forgotten about my offer to take your submissions and use them for this series, but I think I’m going to hold off until after I get back from Europe. Between my endless and compulsive planning and packing, and the organizing I’m doing behind the scenes for the week of guest-posters, I think it would be better to wait. Can you imagine if that was your front stoop? Either door would work for me. I love that both the black and the pink pop even more because of what they’re next to. Talk about complementary colors. And before we get too far, both blankets are from West Elm, because while I promised not to use another one from Lands Downunder, I made no such assertions for West Elm. 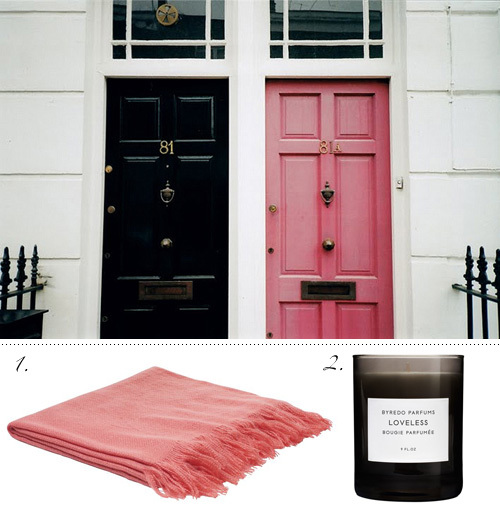 On a related note: it is very difficult to find decent throw blankets in multiple colors and textures online. Inevitably I end up sorting through fleece blankets with college football team logos on them. Don’t you just want to know what they’re drinking? It looks like lingonberry juice to me, watered down. What do you think? 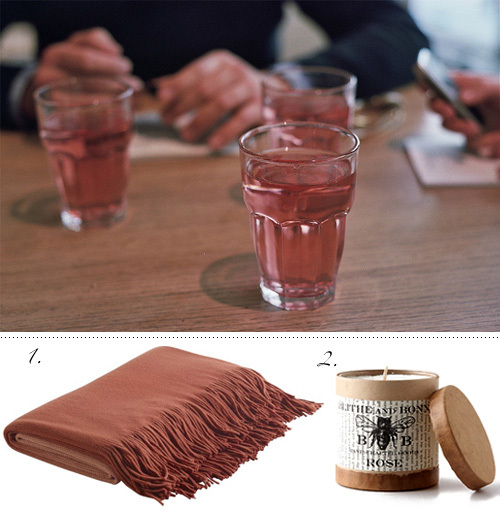 Yes, I didn’t have to look too far to find that West Elm blanket, but it matches whatever in is their glasses perfectly. Alright kiddos, how is everyone doing so far this week? We’re all hanging in? It’s almost Friday! Just when I’m getting nervous and think I have nothing to write about, something perfect falls into my lap. I got an email last night from Theresa and Tori (hi lovelies!) with a Photoshop question. It’s been a while since my last Photoshop tutorial, and with nothing on the schedule for today it seemed like the perfect opportunity to tackle it. Theresa and Tori were both curious how to create long, scrolling layouts in Photoshop. You know, ones that don’t fit entirely on the screen, that you have to keep scrolling down to see the rest of. A perfectly legitimate question! The way Theresa explained she was going about it now seemed far too circuitous, and it’s so easy to do in Photoshop. In fact, determining the size of your layout is actually the first thing you do in Photoshop. So the Keane streak continues, this week with a song that’s been released in some parts of Europe as the first single off the new album. Which, by the way, will be released in less than 2 weeks (!!). With all of the countdowns I’ve got going on right now leading up to the middle of May it’s no wonder why I’ve been popping awake at 5:45am every morning. This is so not me, either. I’m one of those corpse-sleepers. The moment I get horizontal, I’m out until my alarm goes off, and not a moment sooner. Not even for freak thunderstorms or other natural disasters. Oh, well, unless Fitz is sleeping in the bed. And then I’m up every hour wrestling with his bony pokey legs he insists on sticking straight into my side repeatedly. It’s like sharing the bed with an angry bag of popsicle sticks. Imagine how far out of my own skin I jumped when the song ended and there was 15 seconds of silence, long enough to lull me into a false sense of security, before the guy chops down the door with an ax and then strangles her through it while she shrieks in terror. I nearly wet myself. At work. Yesterday marked 3 weeks until I depart for a little trip to Europe. I know I haven’t been talking about it ad nauseum or anything, so this might come as a surprise to you, but I am nearly jumping out of my own skin with excitement. I finally bought Thalys tickets from Brussels to Paris and back yesterday, and I’d say I’m all but prepared for the trip but in my neuroses I went through my outfits again and realized I’m an entire day short. Like, one whole day. I’ll either have to scramble to come up with something or be naked (or go for this little number). How is it possible to remember to buy outlet converters and pack a mending kit but forget an entire day’s worth of clothing? Oh, we still need one day/night’s worth of plans and accommodations between Gent and Brussels, and we can’t decide whether to stay in Gent for another night or take a quick trip to Antwerp. We originally had our hearts set on staying at a converted castle hotel in the Belgian countryside, but car rentals were exorbitantly expensive and the castles were either booked or required a multiple night stay on the weekends. Le sigh. Anyway, I found this calendar last week and considered including it in the Friday Five but really thought it deserved its own special post. The more I looked at it, the more awesome it got. You might remember that I had a Stendig calendar last year, the pages of which I kept and saved for wrapping presents this Christmas. Seeing as each sheet was thick paper and 2′ x 3′, it seemed crazy to go to waste (although, maybe it was crazier to save a tube of old calendar pages for an entire year and one move). 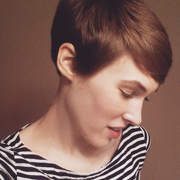 But then I didn’t get another one for this year, despite how much I loved its monochrome-ness and general sexiness. And I realize it’s too late in the year to commit to a calendar from which I’d have to discard a quarter. Enter, the On This Day calendar. Like the Stendig, this thing spans about 3 feet, giving off an intentional wall-art feel once hung. 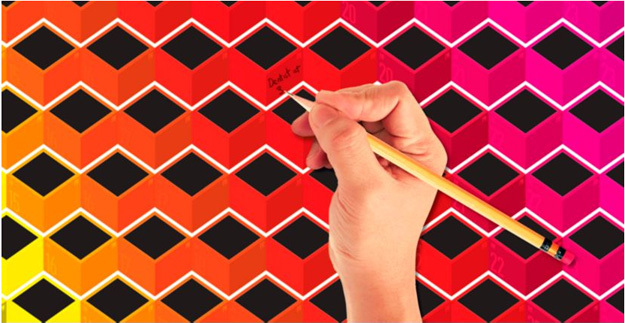 Unlike its less-colorful counterpart, the On This Day has a daily fact hidden under a heat-sensitive black square above the geometric day spot (it fades back to black after a few seconds), and is fully wipeable, making it reusable year after year. Perhaps its only negative is that because it’s meant to be reused, there are no set day designations above the numbers. January 18th could be a Wednesday or a Sunday, May 24th could be a Tuesday, and for someone as clueless and generally lost as I am, this is a big deal breaker. Plus, while I like the ability to write down appts or special events on a given day, I like even more the ability to go back and check out what I was doing on a specific Saturday 2 years ago. This seems only achievable with my Blackberry calendar, but that sadly doesn’t make for interesting wall art. How do you guys keep track of everything? 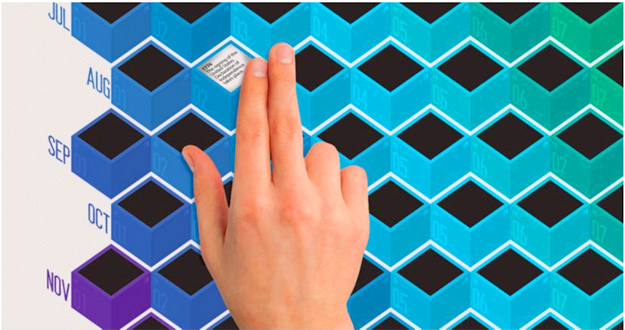 Wall calendars? Cell phones? Computer alerts? I’m curious. Also, a very happy birthday to my Mommom, who turns 87 today! She’s still as spry and sassy as ever! We survived another week, you guys! This week at times felt like it was whizzing past me and at times made me feel like I was stuck in quicksand. Have you ever had one of those weeks? I’ve been really busy at work, which is great, and after my amazing review last Friday I feel prepared to handle whatever workload is thrown at me. Of course, my rampant productivity burns me out so this whole week I’ve been passing out even earlier than my usual and preferred 9:30pm bedtime. My favorite thing about spring, aside from keeping the windows open and seeing the sun stay out past 7, are wishy flowers. More technically, Taraxacum, which I didn’t know was their name until I googled it. Ever since I was a kid I’ve been unable to walk past one in a patch of grass and not pick it and blow on it and make a wish. I did it yesterday, in fact. I think it’s magical and fun and I’ll do it no matter how old I am. And I’ll always call them wishies; Taraxacum is too hard to pronounce and nowhere near as whimsical. This antique book plate from a Swedish (!) flora book published in 1905 (!!) is a steal, and would look beautiful in a small frame on a nightstand next to that gorgeous sea-foam carafe. Don’t they complement each other nicely? You could have both for under $20. I’ll admit, I kind of have a thing for scarves, and I don’t need to remind any of you I have a thing for Sweden. This is totally one of those Gary-Oldman-eating-macarons things: two of your favorite things coming together magically. Stockholm map on a scarf. You guys. If it weren’t over $100 and I wasn’t sticking to a more stringent Europe budget, I might indulge. 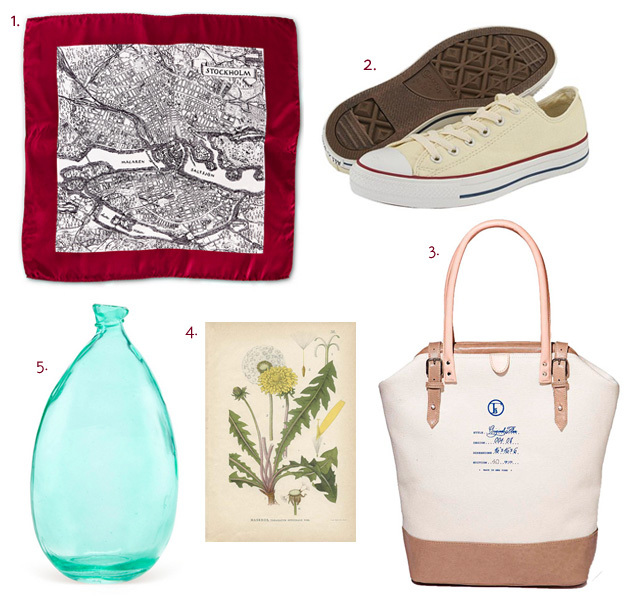 The same can be said for that gorgeous tote bag from Flea Bags, the creation of Brooklyn-based designers Shira Entis and Alex Bell. Their mission was to create eco-minded bags that were also fashionable. Mission accomplished, ladies. I am crazy in love with it, the mix of canvas and leather and those buckles! I’ll make it mine one day. Nina reminded me in this post on Wednesday that I’m overdue on buying a new pair of white Converse. I practically live in these shoes, and have since high school when I was super cool and used to write Pink Floyd lyrics on the rubber part around the sides. I don’t do that now, but I wear a pair to death and always hate having to throw them out even when the soles are coming apart and the canvas is permanently brown from dirt. I took advantage of Zappos free overnight shipping and bought a new pair. In case you were going to point out my aforementioned strict Europe budget, I’ll have you know I might just incorporate these into my wardrobe over there. So, win-win. This weekend is my brother’s birthday (he’ll kill me if I put his age on here, but let’s just say he’s older than all of you) and we’re also going to a double-header at Boyfriend’s college to celebrate the new baseball facility, in honor of their late Athletic Director. If the rain holds off, it should be a really nice weekend. What are you guys up to? This all started with a backpack. And not just any backpack, but the Fjällräven Kanken I wrote about back in September. That particular Swedish brand has been everywhere recently, all over street photography and even popping up over on J. Crew. In a very un-me decision, I’ve held off buying it because I don’t have any need for it, though I do think that many (MANY) years from now it will make a pretty hip diaper bag. And while I haven’t bought it and snuggled with it yet, it’s making me appreciate backpacks again. So when I saw this Abingdon backpack (also from J. Crew), I couldn’t help but pull together my ideal Spring/early-Summer outfit, letting the masculinity of the bag influence the rest of the pieces. To be honest, this is much more my style than a frilly summer dress. Yep, those are my exact glasses, and it was just a stroke of luck they happened to work so well with this round-up. 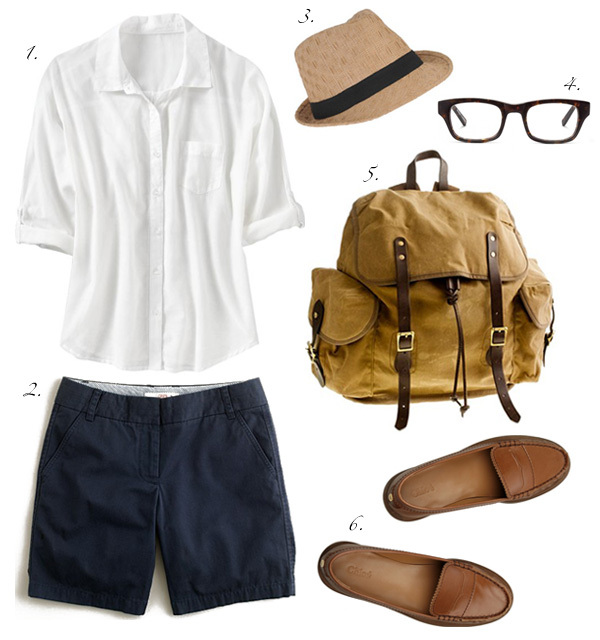 I love the simplicity of a white button-down and a simple pair of chino shorts, and even those $600 loafers. Doesn’t that backpack look so comfortable, like you could just throw your camera and a magazine and maybe a scarf in it and walk around all day? But you have to do it in style, so make sure you wear a fedora; I had one a few years ago and I swear, I’ve never gotten more compliments from random strangers than when I wore it. Some might have been sarcastic, now that I think about it. I didn’t get picked for jury duty! I mean, for the actual trial. I did have to sit in a courtroom with 35 other perspective jurors and answer a bunch of voir dire questioning and then individual questions from 11am until 4pm. The case was a personal injury suit, and I’m confused as to how it escalated to the Federal level (Jennifer, a little help?). The guy was suing for monetary damages after sustaining a foot injury at work, and they found me to be an undesirable juror since I’d had foot injuries of my own, had a family member who was a plaintiff in a personal injury suit, and happened to have a friend who’s an assistant US Attorney at the same courthouse. I still had to sit there all day until they made their selections. I finished reading Rick Steves’ guide to Belgium, though! And I’m off the jury pool list for at least two years. I’m not too scared about getting picked again, not because I don’t think it’s likely but because they made it clear from the video they showed us once we were all checked in that Federal cases do not include crimes of passion, i.e. homicide. Personal injury and white collar crimes? Now those I can handle! I didn’t get to listen to my iPod once I got off the bus yesterday and got in line for the metal detectors to get into the courthouse, which was brutal because I’ve been playing this new, bonus-track, unreleased Keane song non-stop since I got it. And how did I get it, you ask? Well, Keane was giving away a limited number of downloads of it if you played a game on their facebook page. Ahem. Obviously I jumped at the opportunity, and I was rewarded with this beautiful, beautiful song. It is so perfect, and reminds me so much of their first album. I don’t know how I’m going to survive until May 7th when the rest of the album comes out, but this song is definitely tiding me over. It’s okay to be jealous. I actually can’t believe my luck. 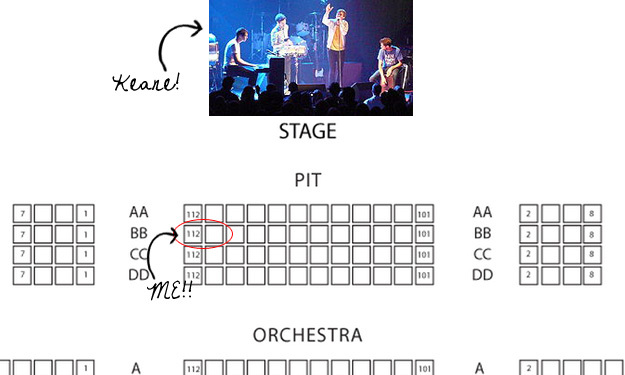 I found out that Keane is also playing a one-off show in Paris one of the night’s we’ll be there in May, and I’m seriously debating buying tickets for that show, too. I’m already “dragging” Boyfriend (I say that facetiously, he is adorably excited to go with me) to one show here, maybe I’ll relent and not throw a concert into our trip itinerary. Speaking of trip itinerary, I’m in the process of organizing a bunch of wonderful guest-bloggers for that week+ and am so excited and thrilled to share them with you! Not just yet, though. You’ll have to wait another month to find out!